Every day, nearly 18,000 Wright State students walk the tunnels, halls, and pathways of Wright State to figure out the answer, take an exam, get a bright idea, volunteer, sink a three-pointer, write from their heart, give a speech, take flight, start a business, save the environment, cheer for the team, consider another perspective, lead a group, and study abroad. Every day, YOU make it happen. Our faculty and staff inspire, challenge, advise, answer questions, find solutions, keep classrooms running, crunch numbers, coach, nourish, connect, enrich, give a shoulder to lean on, and offer a friendly smile. Be among the more than 3,000 faculty, staff, and retirees who continue to make an impact through our annual Campus Scholarship and Innovation Campaign (CSIC). 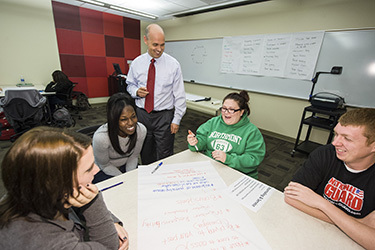 Our faculty and staff’s dedication to Wright State and its students is truly an inspiration. Contributions from faculty, staff, and retirees do more than provide funds for programs, scholarships, or other needs. They are an endorsement of the university. They show that this university is more than just an employer—it’s about our Wright State family signaling to alumni, friends, corporations, and foundations that this is an institution worthy of support. During the 2016 campaign, we raised more than $736,000 for student scholarships and programs and our full-time faculty and staff had a participation rate of 50%.